Tired of cooking? Looking for something less expensive than take-out from a restaurant? Then a new venture on Vitti Street in New Canaan, GOOD2GOURMET, may be an alternative. The brainchild of local resident and mother of four, Lisa Strupp, GOOD2GOURMET offers a variety of soups, salads, and entrées for families to enjoy. Teaming with business partner Kevin Schmudde, the two enlisted the culinary skills of Executive Chef Eric Ulbrich to create a menu that includes soups, salads, pastas, and entrées. Customers go to the website (they do not take telephone orders), place their order, choose a 1-hour delivery window (curbside pick-up at the store is also available) and the food will be on the front stoop as requested. Alternatively, customers can visit and purchase a selection of items at the store. 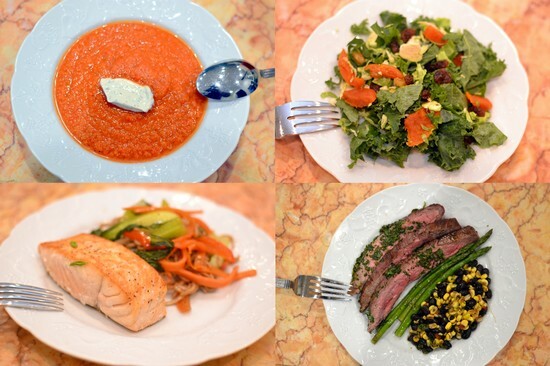 On my recent visit, I chose the Kale and Sprout Salad and Gazpacho to start the meal and the Mirin Glazed Salmon and the Flank Steak Cimichurri for the entrée. Cooking the two entrées was very easy. I followed the instructions and lightly covered the foil container with foil and baked for the recommended 25 minutes. While the entrees were in the oven we ate the first courses. There was an ample amount of salad for two adults. I loved the sweetness of raisins and apricots and how they paired with the kale and the citrusy dressing. The salad must be lightly dressed, so the balance between the dressing and the kale is maintained. I also enjoyed the addition of the shaved Brussels sprouts. The Gazpacho offered bold flavors, but the sour cream was a little too tart and I would have preferred a dollop of Greek yogurt. Likewise I prefer a gazpacho with chunks of the vegetables but for those who are looking for a smoother variety this is a good choice. Of the two entrées, I thought the salmon was very good. The dish contained two 5-ounce fillets of Canadian Atlantic Salmon with a sweet and savory mirin-soy glaze served over ginger soy ponzu soba noodles and a bok choy & vegetable stir fry. It delivered great flavor from the mirin glaze and the soba & bok choy were delicious with a great balance of Asian flavors. The sliced flank steak (11 ounces) was served with a Chimichurri sauce (garlic, parsley, red pepper, cilantro and olive oil) sauce, served atop a black bean and corn salad and grilled asparagus. The mild steak was a little under-seasoned, and adding a touch of salt awakened the taste buds. I would also delay adding the Chimichurri sauce until the steak is heated so the asparagus and the corn and bean salad offer their full flavors. After a few weeks, the food shows great promise and the deliveries toNew Canaan and Darien have commenced. I would prefer if GOOD2GOURMET also offered an option to call to either place the order or to inquire if a particular item was available in one of the store’s refrigerators, maybe this will change. New Canaanites now have a delivery option when they anticipate that their afternoon time will be at a premium and they desire a well prepared meal on the table in short order.